1. Gather your material. 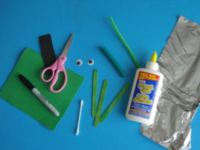 You will need a piece of green Fun Foam, a scrap of black Fun Foam, a cotton swab, three green Popsicle sticks, one green pipe cleaner, two wiggly eyes, green modeling dough, a black marker, aluminum paper, white glue and/or hot glue, and scissors. 2. 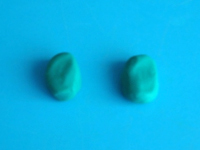 Using the green modeling dough, create two feet as shown. 3. 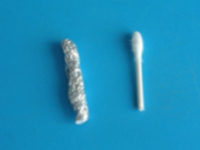 Cut the cotton swab in half and wrap both pieces in aluminum paper. 4. 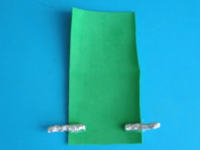 Cut a rectangle out of the green Fun Foam and glue both cotton swab pieces wrapped in aluminum paper on either side, towards the bottom. 5. 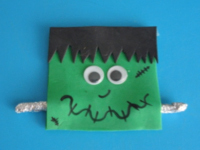 Fold the upper portion of the Fun Foam rectangle down to form a square and glue both parts together. Cut your figurine's bangs out of the black Fun Foam. 6. 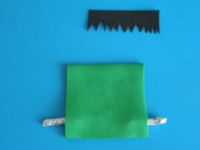 Glue your figurine's bangs at the top of the green square. Add the wiggly eyes just below. Use the black marker to draw a nose, a mouth, and scars on your figurine's face. 7. 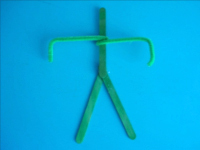 Glue the three Popsicle sticks together to form your figurine's body as shown. Wrap the pipe cleaner around your figurine's waist and fold the ends to represent its arms and hands. 8. Glue the head on your figurine's body. 9. Press both legs in the modeling dough feet. 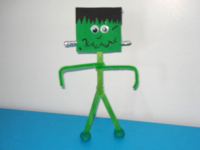 Your little Frankenstein will stand on its own. 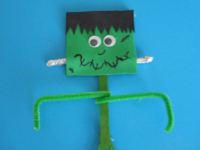 Use it to create a variety of Halloween scenarios or simply to decorate your daycare.